Bring out a small wooden box and place it down on the table. Have a playing card freely chosen and signed by a spectator. Shuffle it back into the deck and ask, "Do you think that I can find your card in less than ten seconds without even looking at the cards?" Hold the deck behind your back for several seconds, then bring it out and announce, "I've found it!" Pause briefly, then continue, "And guess where it is..." Point to the wooden box that has been resting on the table all along. There's absolutely no way the card could be inside because no one has been anywhere near the box. Slowly reach over with your empty hand and pick up the box, then bring it over to the spectator and say, "Please remove the lid." The spectator lifts the lid and sees a folded card inside. Turn the box over and dump out the card, then place the empty box down on the table. The spectator unfolds the card; it is his card with his signature! At the conclusion you can leave the box on the table for your audience to handle; they won't find a clue to the mystery. Mystery Box II , It looks like an elegant container, not like a gimmick or prop. The routine is easy to learn with no difficult sleight-of-hand. 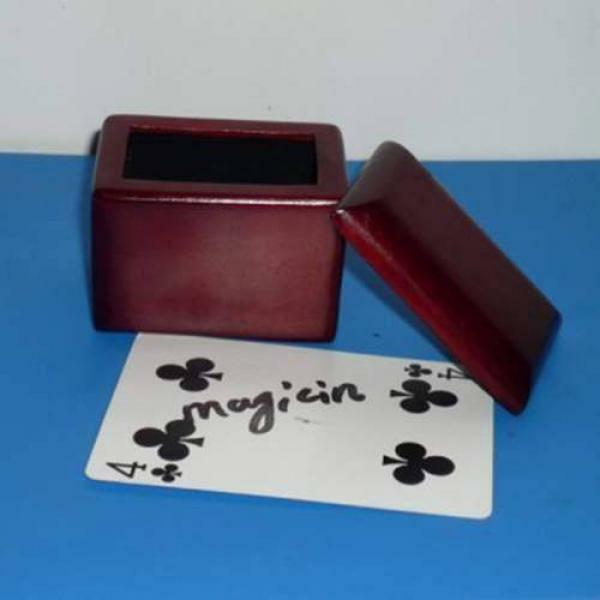 The illusion is now 3D - your audience sees a creased, folded card inside the box. Also, the box can be FULLY EXAMINED because the gimmick is recessed and concealed from view!